Just like everyone organizes a little bit differently (find out your organizing style here), not all cleaning routines work for the same for everyone either. Some people are daily zone cleaners while others would rather dedicate one day each week for a full house clean. Power Hour cleaning routines are really popular right now too, but for me, I like a quick and easy DIRTY 30 daily speed cleaning routine. My ADHD brain makes it hard for me to concentrate on boring or mundane tasks for very long. Unfortunately, housework is one of those things I have a very short attention span for. That is why this Dirty 3o routine really works for me. Each task is just 10 minutes long for a total of 30 minutes. I set my timer for 10 minutes and rush to get as much done, as fast as I can! You will be amazed at how much you can accomplish in just ten short minutes. Once my timer is up, I move onto the next area, whether I am done the current task or not. If I need to, I repeat the three areas as many times as needed until they are all clean! 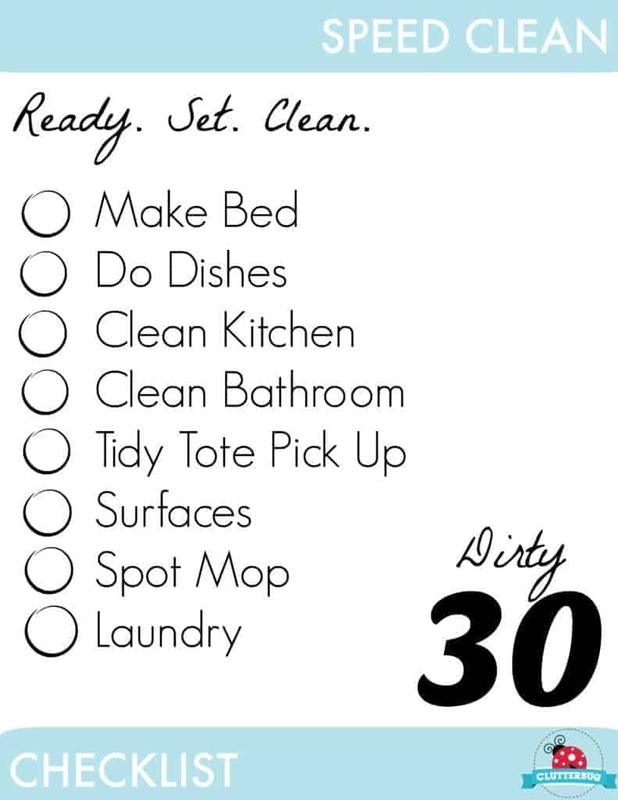 You can download your own FREE Dirty 30 Cleaning Routine Checklist now! Download this free DIRTY 30 Kitchen and Bathroom Routine HERE. For me, this kitchen, tidy and bathroom daily routine rarely takes me a full 30 minutes. If you try and do this quick routine each and everyday, I’m certain you can get it down to an easy 15 minutes total. 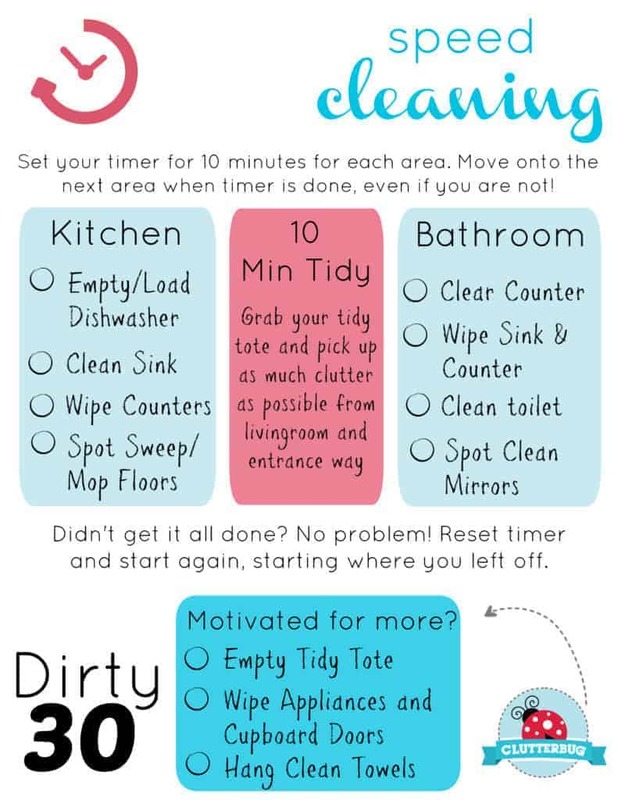 This routine makes a perfect 15 minute nightly cleaning routine. Once your home is pretty consistently tidy and clean, you can try the Dirty 30 routine below. It is meant for homes that are already pretty clean and clutter-free as a way of daily easy daily maintenance. Clutter Buster Contest! Win a Clean and Organized Space! Oh “me” time, where have you gone? Why not use a coupon?